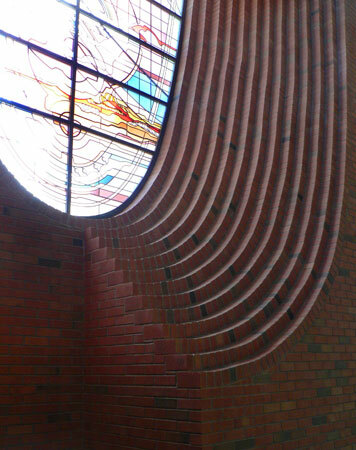 Designed by Ralph Haver & Associates in 1963, (and later the firm of Geogrge Christensen) this red brick church campus dovetails neatly with other commercial and civic designs that Haver was completing at the height of his career. 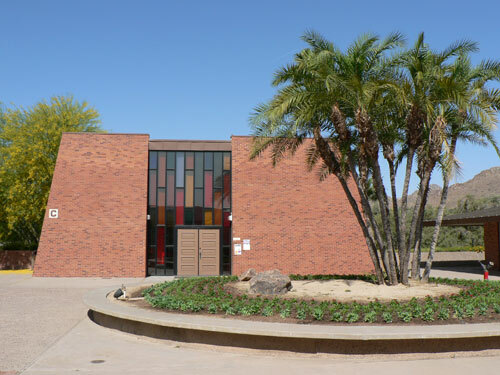 The campus is situated on a sprawling piece of pristine desert land in the foothills of Lincoln Drive, with stunning views of Camelback Mountain and the Valley below. 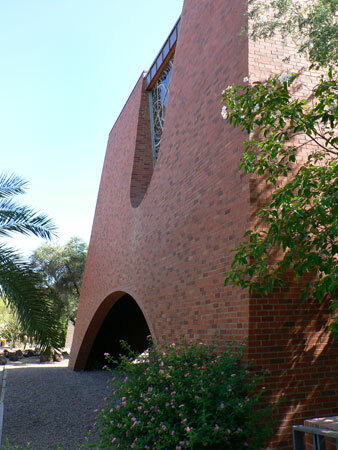 The first chapel is accessed by crossing a raised bridge over a desert wash, featuring geometric ralings that lend unity as well as modest grandeur to the journey. 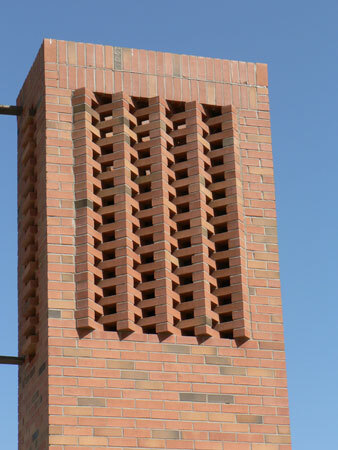 The ziggurat-like facade of brick is supported by steel framework inside. 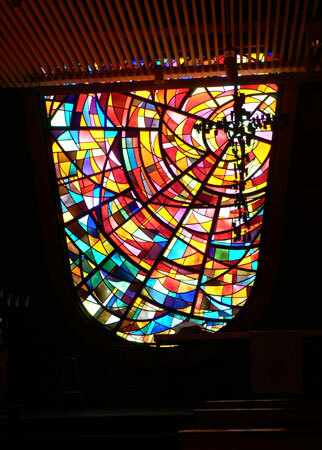 Simple stained glass forms are unfussy but decorative. 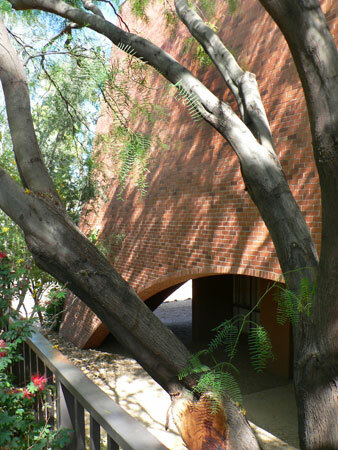 The deeply-shaded archways are a motif that would also be repeated in Haver's legendary Cine-Capri theater and Barrow's furniture in the Biltmore area, designed around the same time. 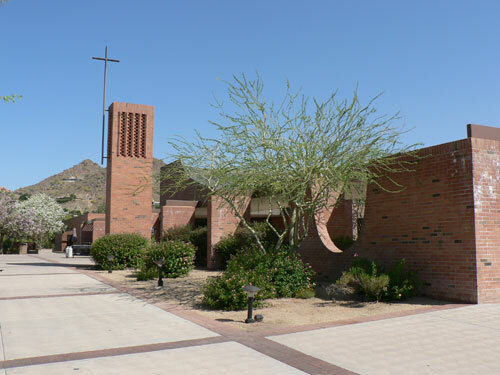 The desert oasis metaphor is nowhere more prominent than in the chapel courtyard. 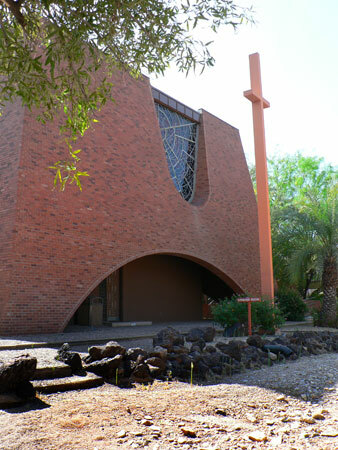 The chapel glasswork was completed by the famous Glassart Studio of Scottsdale, who furnished many churches and commercial buildings of the sixties. 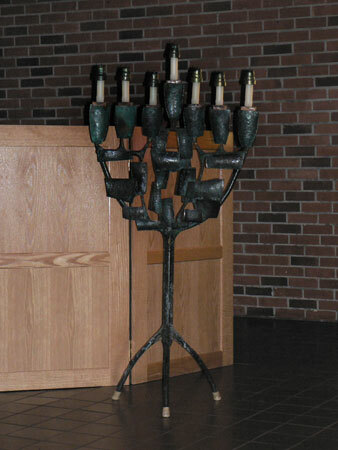 Custom bronze castings are found throughout the altar area. 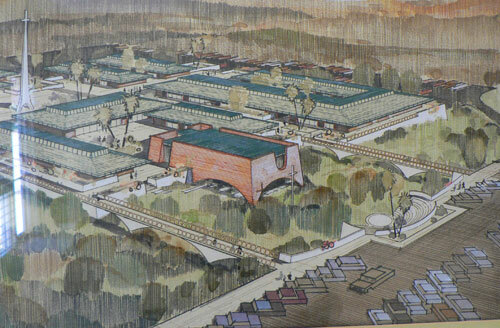 Some of the firm's most beautiful renderings were created by James Salter. 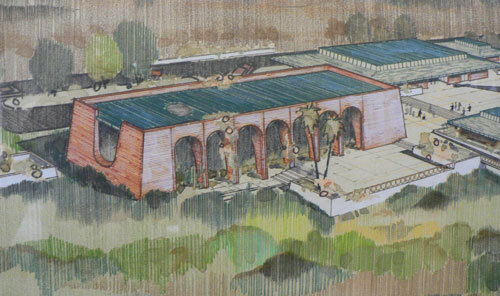 This huge four-foot colored pencil rendering is on display in their community room. 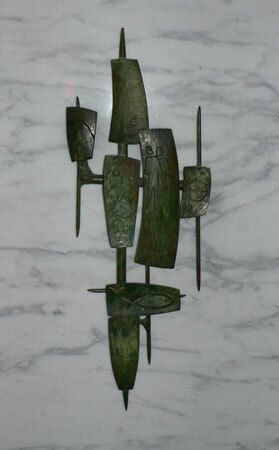 Salter, a talented artist, industrial designer and interior decorator responsible for much of the "Haver Look" met an untimely and premature death in the 60s while at the height of his career working for the Hawaii office of Haver, Nunn and Jensen. 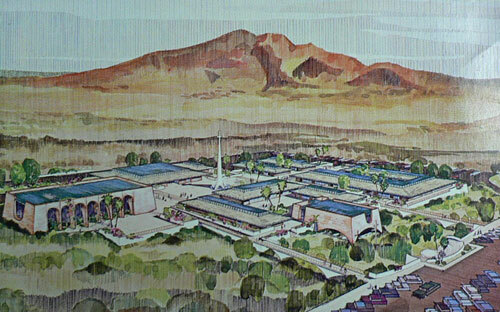 The design in the rendering of the main sanctuary was never realized in this form. 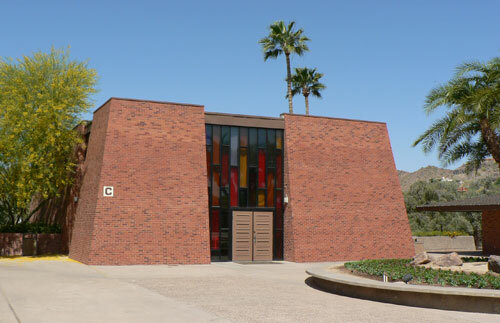 Arizona Architect George Christensen's firm finished the campus design, with architect David Jones taking the lead. 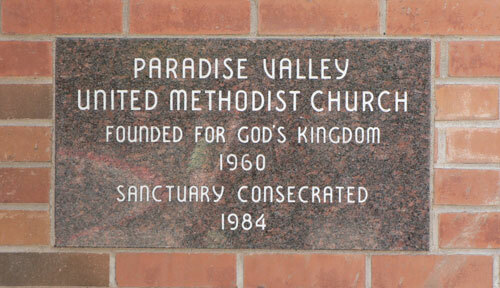 The sanctuary was consecrated in 1984. 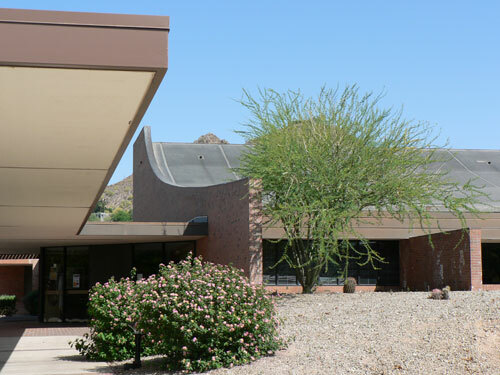 The sweeping roofline is in perfect proportion with Squaw Peak and Camelback Mountain, allowing them to exert their prior authority to the heavens. 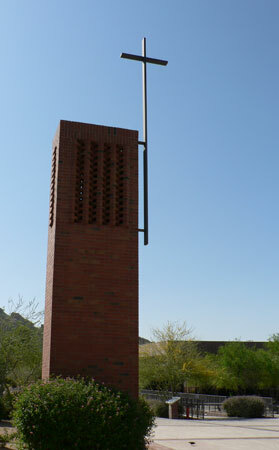 The carillon demonstrates an unusual approach to block fenestration. 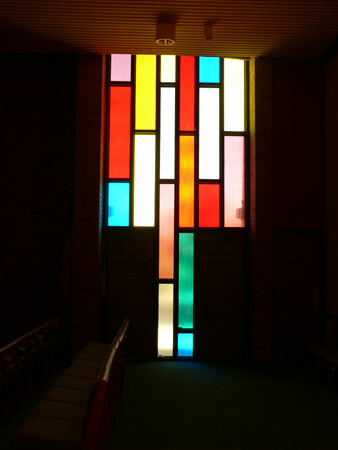 Stained glass designs were by Maureen McGuire. 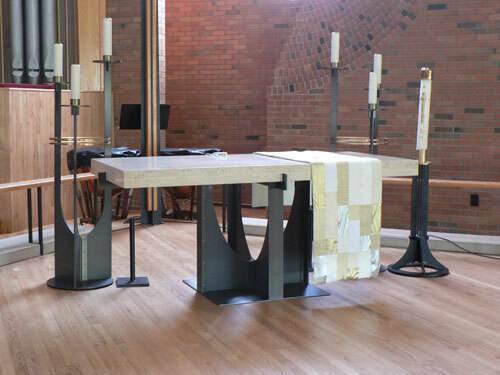 In the main sanctuary expertise in masonry is really allowed to shine. 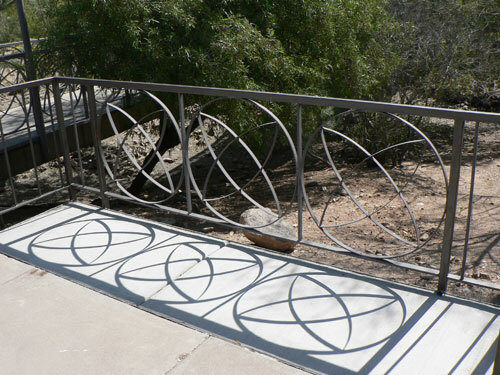 Arched motifs carry through to the altar and interior furnishings. 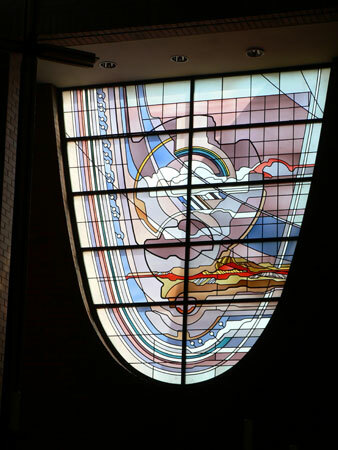 The stained glass art appears to be of a monsoon theme. 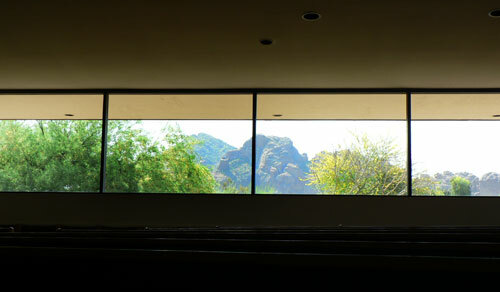 High clerestory windows perfectly frame the head of Camelback Mountain without letting in the distraction of foot traffic in the plaza. 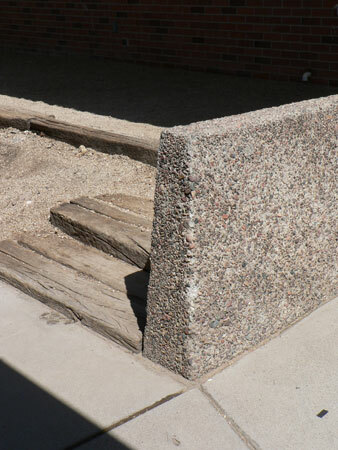 Appropriately-scaled concrete and aggregate walls line the walks of the education buildings. 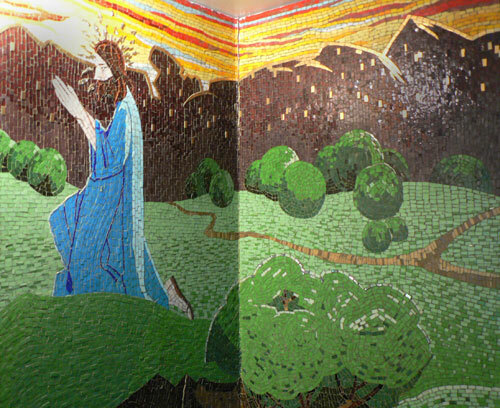 A small prayer room at the base of the chapel features a lovely mosaic, and is open 24 hours to the public.